Cooking is as much a science as it is an art—both following a strict set of instructions or creating a new dish on the spur of the moment can yield excellent results (and full bellies). Even the most extemporaneous chef, however, has a stash of favorite recipes on hand—if not for anything else, then just to draw inspiration from when the next meals comes calling. 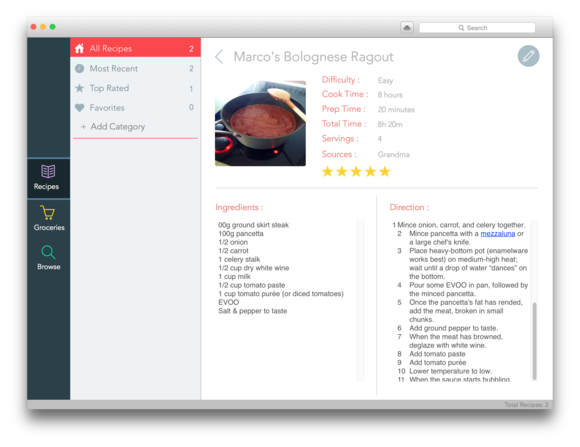 Recipes (Mac App Store link) gives chefs of all skill levels a digital box in which they can save, consult, and find their recipes. The app offers an elegant interface that captures all the essentials elements of a recipe: basic data like name, difficulty level, and cooking time are recorded alongside step-by-step instructions and an ingredient list. A separate grocery list is also available, although, unfortunately, there is no way to populate it with a recipe’s ingredients, or to sync it with the Reminders app. Recipes can also import cooking instructions from a website of your choosing through a built-in browser (to get you started, the app provides a list of the most popular recipe websites). The process isn’t particularly intuitive—you can copy text and drag it to the various fields that the app provides—and doesn’t offer a lot of feedback, but it does work and, once you get used to the process, makes grabbing recipes from the Web relatively easy. The search functionality works quite well, although it doesn’t seem to extend to the ingredients list or step-by-step instructions—a handy feature when all you have in the fridge is a pound of ground beef and you don’t feel like eating burger patties for dinner.